The National Archaeological Museum (Greek: Εθνικό Αρχαιολογικό Μουσείο) in Athens houses some of the most important artifacts from a variety of archaeological locations around Greece from prehistory to late antiquity. It is considered one of the greatest museums in the world and contains the richest collection of artifacts from Greek antiquity worldwide. 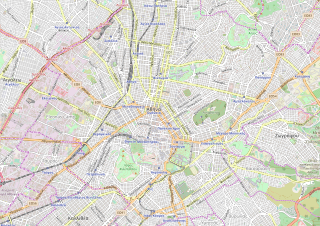 It is situated in the Exarcheia area in central Athens between Epirus Street, Bouboulinas Street and Tositsas Street while its entrance is on the Patission Street adjacent to the historical building of the Athens Polytechnic university. 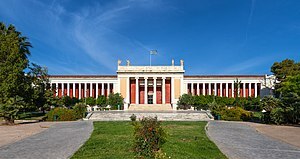 The first national archaeological museum in Greece was established by the governor of Greece Ioannis Kapodistrias in Aigina in 1829. Subsequently, the archaeological collection was relocated to a number of exhibition places until 1858, when an international architectural competition was announced for the location and the architectural design of the new museum. The current location was proposed and the construction of the museum's building began in 1866 and was completed in 1889 using funds from the Greek Government, the Greek Archaeological Society and the society of Mycenae. Major benefactors were Eleni Tositsa who donated the land for the building of the museum, and Demetrios and Nikolaos Vernardakis from Saint Petersburg who donated a large amount for the completion of the museum. The initial name for the museum was The Central Museum. It was renamed to its current name in 1881 by Prime Minister of Greece Charilaos Trikoupis. In 1887 the important archaeologist Valerios Stais became the museum's curator. During World War II the museum was closed and the antiquities were sealed in special protective boxes and buried, in order to avoid their destruction and looting. In 1945 exhibits were again displayed under the direction of Christos Karouzos. The south wing of the museum houses the Epigraphic Museum with the richest collection of inscriptions in the world. The inscriptions museum expanded between 1953 and 1960 with the architectural designs of Patroklos Karantinos. The museum has an imposing neo-classical design which was very popular in Europe at the time and is in accordance with the classical style artifacts that it houses. The initial plan was conceived by the architect Ludwig Lange and it was later modified by Panagis Kalkos who was the main architect, Armodios Vlachos and Ernst Ziller. At the front of the museum there is a large neo-classic design garden which is decorated with sculptures. The building has undergone many expansions. Most important were the construction of a new east wing in the early 20th century based on the plans of Anastasios Metaxas and the construction of a two-storeyed building, designed by George Nomikos, during 1932–1939. These expansions were necessary to accommodate the rapidly growing collection of artifacts. The most recent refurbishment of the museum took more than 1.5 years to complete, during which the museum remained completely closed. It reopened in July 2004, in time for the Athens Olympics and it included an aesthetic and technical upgrade of the building, installation of a modern air-conditioning system, reorganisation of the museum's collection and repair of the damage caused by the 1999 earthquake. 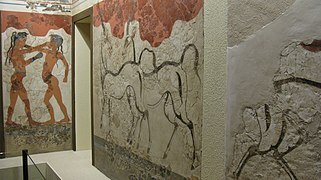 The Minoan frescoes rooms opened to the public in 2005. On May 2008 the Culture Minister Mihalis Liapis inaugurated the much anticipated collection of Egyptian antiquities and the collection of Eleni and Antonis Stathatos. Today, there is a renewed discussion regarding the need to further expand the museum to adjacent areas. A new plan has been made for a subterranean expansion at the front of the museum. The prehistoric collection displays objects from the Neolithic era (6800–3000 BC), Early and Mid-Bronze age (3000–2000 BC and 2000 to 1700 BC respectively), objects classified as Cycladic and Mycenaean art. There are ceramic finds from various important Neolithic sites such as Dimini and Sesclo from middle Helladic ceramics from Boeotia, Attica and Phthiotis. Some objects from Heinrich Schliemann excavations in Troy are also on display. Cycladic collection features the famous marble figurines from the Aegean islands of Delos and Keros including the Lutist. These mysterious human representations, which resemble modern art and inspired many artists such as Henry Moore, came from the 3rd millennium BC old cemeteries of Aegean islands along with bronze tools and containers. 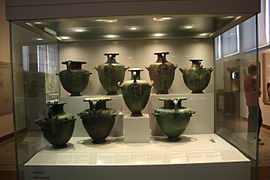 Mycenean civilization is represented by stone, bronze and ceramic pots, figurines, ivory, glass and faience objects, golden seals and rings from the vaulted tombs in Mycenae and other locations in the Peloponnese (Tiryns and Dendra in Argolis, Pylos in Messinia and Vaphio in Lakonia). Of great interest are the two golden cups from Vafeio showing a scene of the capture of a bull. Mycenean collection includes also the magnificent 19th-century finds of Heinrich Schliemann in Mycenae from the Grave Circle A and the earlier Grave Circle B. 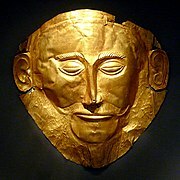 Most notable are the golden funerary masks which covered the faces of deceased Mycenean nobles. Among them, the most famous is the one that was named erroneously as the mask of Agamemnon. 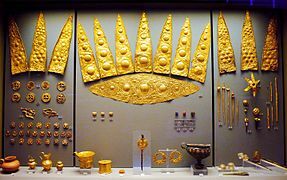 There are also finds from the citadel of Mycenae including relief stelae, golden containers, glass, alabaster and amber tools and jewels. Other features include an ivory carving of two goddesses with a child, a painted limestone head of a goddess and the famous warrior's vase dating from the 12th century. The Egyptian collection dates back to the last twenty years of the 19th century. 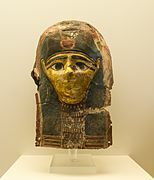 Notable is the donation of the Egyptian government which in 1893 offered nine mummies of the era of the Pharaohs. However, the Egyptian collection is mainly by two donors, Ioannis Dimitriou (in 1880) and of Alexandros Rostovic (in 1904). In total the collection includes more than 6000 artifacts, 1100 of which are available presently for the public. The collection is considered to be one of the best collections of Egyptian art in the world. The exhibition features rare statues, tools, jewels, mummies, a wooden body tag for a mummy, a stunning bronze statue of a princess, intact bird eggs and a 3000-year-old loaf of bread with a bite-sized chunk missing. The exhibition centrepiece is a bronze statue of the princess-priestess Takushit, dating to around 670 BC. Standing 70 cm high and wearing a gown covered in hieroglyphs, the statue was found south of Alexandria in 1880. The Stathatos collection is named for the donors and major Greek benefactors Antonis and Eleni Stathatos. The collection features about 1000 objects, mainly jewels as well as metal objects, vases, and pottery from the Middle Bronze Age to post-Byzantine era. Features of special note are the Hellenistic period golden jewels from Karpenissi and Thessaly. 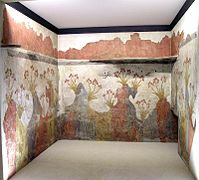 Some of the ancient artists whose work is presented in the museum are Myron, Scopas, Euthymides, Lydos, Agoracritus, Agasias, Pan Painter, Wedding Painter, Meleager Painter, Cimon of Cleonae, Nessos Painter, Damophon, Aison (vase painter), Analatos Painter, Polygnotos (vase painter), Hermonax. Collections include sculpture work, Loutrophoros, amphora, Hydria, Skyphos, Krater, Pelike, and lekythos vessels, Stele, frescoes, jewellery, weapons, tools, coins, toys and other ancient items. 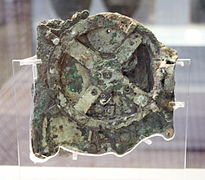 Artifacts derive from archaeological excavations in Santorini, Mycenae, Tiryns, Dodona, Vaphio, Rhamnous, Lycosura, Aegean islands, Delos, the Temple of Aphaea in Aegina, the Sanctuary of Artemis Orthia in Sparta, Pylos, Thebes, Athens, Vari Cave, the Antikythera wreck and from various other places in Greece. The museum houses the archaic terracota statuette daidala that inspired the designers of the 2004 Athens Olympics maskots Athena and Phevos. Two of the newest exhibits of the museum include a 4th-century BC golden funerary wreath and a 6th-century BC marble statue of a woman, which were returned as stolen artifacts to Greece in 2007 by the Getty Museum in California, after a 10-year-long legal dispute between the Getty Center and the Greek Government. One year earlier, the Los Angeles foundation agreed to return a 4th-century BC tombstone from near Greek Thebes and a 6th-century BC votive relief from the island of Thassos. The museum houses a 118-year-old library of archeology with rare ancient art, science and philosophy books and publications. The library has some 20,000 volumes, including rare editions dating to the 17th century. The bibliography covers archaeology, history, arts, ancient religions and ancient Greek philosophy, as well as Ancient Greek and Latin literature. Of particular value are the diaries of various excavations including those of Heinrich Schliemann. The collection of archaeology books is the richest of its kind in Greece. The Library has been recently renovated with funds from the Alexander S. Onassis Foundation. Its renovation was completed on 26 May 2008 and is now named after Alexander Onassis. ^ "Ministry of Culture and Sports | National Archaeological Museum". 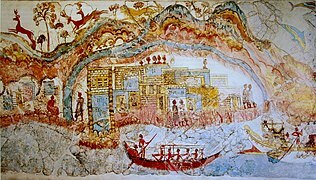 odysseus.culture.gr. Archived from the original on 2007-06-22. Retrieved 2018-02-28. ^ "Ministry of Culture and Sports | Epigraphic Museum". odysseus.culture.gr. Archived from the original on 2012-05-21. Retrieved 2018-02-28. ^ "Egyptian antiquities exhibition". Archived from the original on 2011-06-05. Retrieved 2008-06-10. ^ "BBC NEWS - Europe - Ancient wreath returns to Greece". Archived from the original on 2015-11-22. Retrieved 21 November 2015. ^ "CBC.ca Arts - Greece closes net on antiquities smuggling". Archived from the original on 2007-07-11. Retrieved 2007-07-23. ^ "Rare tomes... - News - ekathimerini.com". Archived from the original on 2014-02-01. Retrieved 21 November 2015. ^ "This Week - News - ekathimerini.com". Archived from the original on 2015-04-11. Retrieved 21 November 2015. Wikimedia Commons has media related to National Archaeological Museum of Athens.